Samson asks the Philistines a riddle about his encounter with honey in the lion carcass, the answer no one but him could give. Though Samson’s riddle is the only explicit example of a riddle in the Hebrew Bible, question and answer, it is based on a private experience the Philistines could not possibly know about, and therefore is more plain unfair wager and provocation than proper riddle. Panel 2: but they could not tell the riddle for three days. The muppety Philistines look at each other, puzzled. Muppety Philistines, gathered about Samson’s wife’s head and shoulders, whispering threats. Samson shrinks back, mildly chastened. 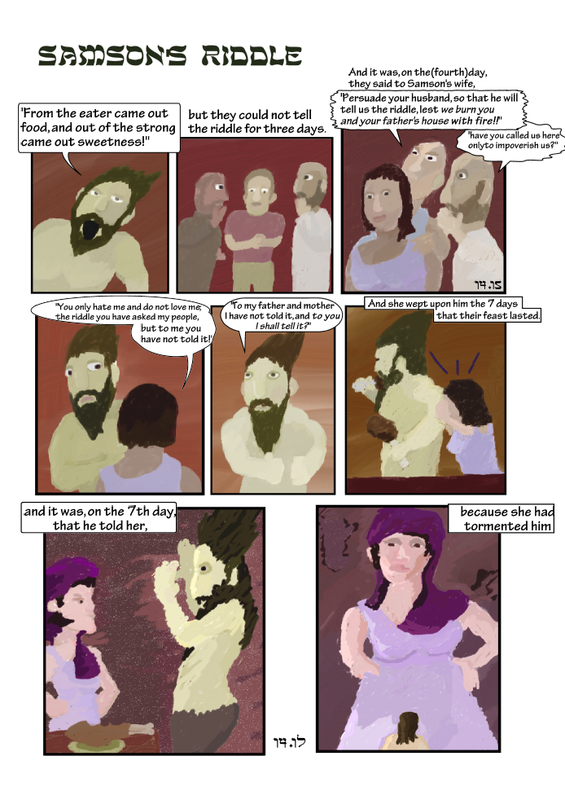 Panel 5: Samson flexes his muscles. I depicted her literally weeping ON him, bodily, while he continues feasting, unmoved. Samson’s wife stares him down by the feasting table, hands on hips, and Samson throws his hands up in surrender. She towers threateningly over the giant Samson, now mouse-sized, dwarfing him. I never liked this bit of Samson. His wife becomes a victim and an accomplice to her murderers.